Before the second half of the 20th century, the nature and cause of breathing problems was very difficult to detect. Before analog biomedical equipment, doctors depended on physical examination of the upper respiratory tract and uscultation: the careful examination of sounds from the chest cavity with their own ears to determine the problem. These techniques often were unreliable. By 1970, analog equipment had made these diagnoses easier to make, but the patient still had to breathe for ten minutes in order to get enough results for a diagnosis. Patients with serious breathing problems often aggravated their existing conditions because of these tests. 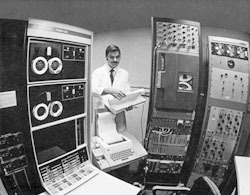 Penn researchers, however, programmed a Digital Equipment Corporation PDP-12 to analyze a few breaths made into an input device. Not only did this equipment give doctors better data for diagnosis than previous techniques, but patients also now could be tested without endangering their health.